Learn more about IAM terms. The user, role, group, and policy objects that are stored in IAM. As with other AWS services, you can add, edit, and remove resources from IAM. The IAM resource objects that are used to identify and group. These include users, groups, and roles. The IAM resource objects that AWS uses for authentication. These include users and roles. Roles can be assumed by IAM users in your or another account as well as users federated through a web identity or SAML. A person or application that uses an entity to sign in and make requests to AWS. A principal is a person or application that can make a request for an action or operation on an AWS resource. As a principal, you first sign in as the AWS account root user. As a best practice, do not use your root user for your daily work. Instead, create IAM entities (users and roles). You can also support federated users or programmatic access to allow an application to access your AWS account. Actions or operations – The actions or operations that the principal wants to perform. This can be an action in the AWS Management Console, or an operation in the AWS CLI or AWS API. Principal – The person or application that used an entity (user or role) to send the request. Information about the principal includes the policies that are associated with the entity that the principal used to sign in. AWS gathers the request information into a request context, which is used to evaluate and authorize the request. As a principal, you must be authenticated (signed in to AWS) using an IAM entity to send a request to AWS. Although some services, such as Amazon S3 and AWS STS, allow a few requests from anonymous users, they are the exception to the rule. To authenticate from the console as a user, you must sign in with your user name and password. To authenticate from the API or AWS CLI, you must provide your access key and secret key. You might also be required to provide additional security information. For example, AWS recommends that you use multi-factor authentication (MFA) to increase the security of your account. To learn more about the IAM entities that AWS can authenticate, see IAM Users and IAM Roles. You must also be authorized (allowed) to complete your request. During authorization, AWS uses values from the request context to check for policies that apply to the request. It then uses the policies to determine whether to allow or deny the request. Most policies are stored in AWS as JSON documents and specify the permissions for principal entities. There are several types of policies that can affect whether a request is authorized. 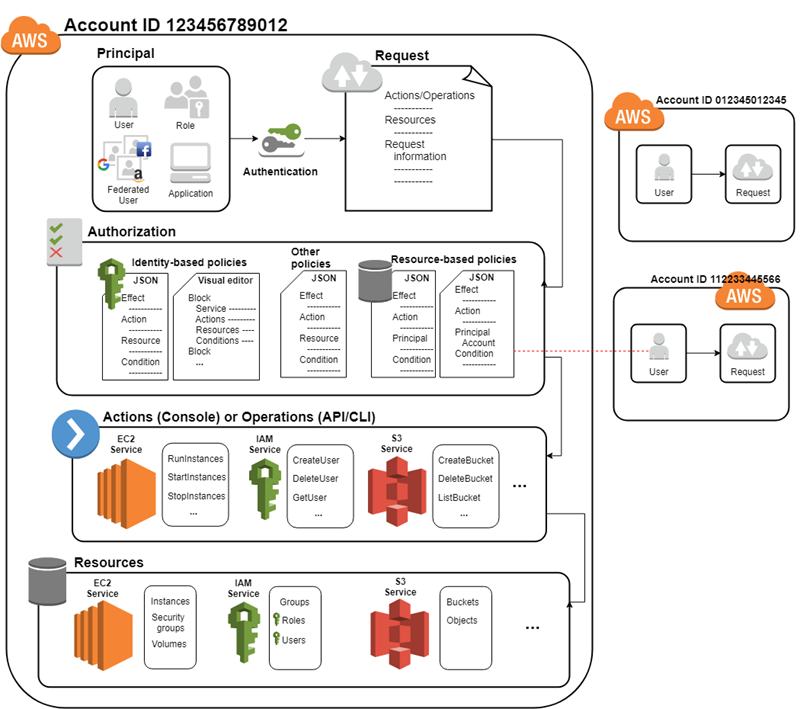 To provide your users with permissions to access the AWS resources in their own account, you need only identity-based policies. Resource-based policies are popular for granting cross-account access. The other policy types are advanced features and should be used carefully. An explicit allow in any permissions policy (identity-based or resource-based) overrides this default. The existence of an Organizations SCP, IAM permissions boundary, or a session policy overrides the allow. If one or more of these policy types exists, they must all allow the request. Otherwise, it is implicitly denied. To learn more about how all types of policies are evaluated, see Policy Evaluation Logic. If you need to make a request in a different account, a policy in the other account must allow you to access the resource and the IAM entity that you use to make the request must have an identity-based policy that allows the request. To allow a principal to perform an operation, you must include the necessary actions in a policy that applies to the principal or the affected resource. To see a list of actions, resource types, and condition keys supported by each service, see Actions, Resources, and Condition Keys for AWS Services. After AWS approves the operations in your request, they can be performed on the related resources within your account. A resource is an object that exists within a service. Examples include an Amazon EC2 instance, an IAM user, and an Amazon S3 bucket. The service defines a set of actions that can be performed on each resource. If you create a request to perform an unrelated action on a resource, that request is denied. For example, if you request to delete an IAM role but provide an IAM group resource, the request fails. To see AWS service tables that identify which resources are affected by an action, see Actions, Resources, and Condition Keys for AWS Services.